Specific Aim: The main goal of this study is to determine how the addition of thrombin alters the proliferative response of vascular tissue leading to early anastomotic failure through G protein coupled receptor signaling. Methods and Results: Porcine external jugular veins were harvested at 24h and 1 week after exposed to 5,000 units of topical bovine thrombin during surgery. Changes in mitogen activated protein kinases (MAPK), pERK, p-p38, pJNK, were analyzed by immunocytochemistry and immunoblotting. Expression of PAR (PAR1, PAR2, PAR3, PAR4) was evaluated using RT-PCR. All thrombin treated vessels showed increased expression of MAPKs, and PAR receptors compared to control veins, which were not treated with topical thrombin. These data suggest that proliferation of vascular tissues following thrombin exposure is at least in part due to elevated levels of pERK. Elevated levels of p38 and pJNK may also be associated with an inflammatory on stress response of the tissue follow thrombin exposure. Conclusion: Bovine thrombin is a mitogen, which may significantly increase vascular smooth muscle cell proliferation following surgery and repair. Therefore, we suggest that bovine thrombin use on vascular tissues seriously reconsidered. Abbreviations: ERK, extracellular regulated kinase; ES, embryonic stem cells; JIP, JNK-interacting protein; JNK, c-Jun NH2-terminal kinase; JNKK, JNK kinase; JNKBP, JNK binding protein; MAPK, mitogen-activated protein kinase; MAPKK, MAPK kinase; MAPKKK, MAPKK kinase; MEK, MAPK/ERK kinase; MEKK, MEK kinase; MKK, MAPK kinase. Topical thrombin preparations have been used as haemostatic agents during cardiovascular surgery for over 60 years [1-3] and may be applied as a spray, paste, or as a component of fibrin glue . It is currently estimated that over 500,000 patients per year are exposed to topical bovine thrombin (TBT) or commercially known as JMI during various surgical procedures. Thrombin is used in an extensive array of procedures including, but not limited to, neuro, orthopedic, general, cardiac, thoracic, vascular, gynecologic, head and neck, and dental surgeries [5, 6]. Furthermore, its use in the treatment of pseudoaneurysms in vascular radiology [7, 8] and topical applications on bleeding cannulation sites of vascular access grafts in dialysis units is widespread . Thrombin is part of a superfamily of serine protease enzymes that perform limited proteolysis on a number of plasma and cell bound proteins and has been extensively characterized regarding its proteolytic cleavage of fibrinogen to fibrin. It is this process that underlies the therapeutic use of thrombin as a hemostatic agent. However, thrombin also leads to the activation of natural anticoagulant pathways via the activation of protein C when bound to thrombomodulin and also alters fibrinolytic pathways via its cleavage of thrombin- activateable fibrinolytic inhibitor (TAFI) . Furthermore, thrombin is also a potent platelet activator, mitogen, chemoattractant, and vasoconstrictor . Regulatory mechanisms controlling the proliferation, differentiation, or apoptosis of cells involve intracellular protein kinases that can transduce signals detected on the cell’s surface into changes in gene expression. Through the activation of protease-activated receptors (PARs, a family of G-protein-coupled receptors), thrombin acts as a hormone, eliciting a variety of cellular responses [11, 12]. Protease activated receptor 1 (PAR1) is the prototype of this family and is activated when thrombin cleaves its amino-terminal extracellular domain. This cleavage produces a new N-terminus that serves as a tethered ligand which binds to the body of the receptor to effect transmembrane signaling. Synthetic peptides that mimic the tethered ligand of PAR activate the receptor independent of PAR1 cleavage. The diversity of PAR’s effects can be attributed to the ability of activated PAR1 to couple to G12/13, Gq or Gi . Importantly, thrombin can elicit at least some cellular responses even after proteolytic inactivation, indicating possible action through receptors other than PARs. Thrombin has been shown to affect a vast number of cell types, including platelets, endothelial cells, smooth muscle cells, cardiomyocytes, fibroblasts, mast cells, neurons, keratinocytes, monocytes, macrophages and a variety of lymphocytes, including B-cells and T-cells [12, 14-21]. Most prominent amongst the known signal transduction pathways that control these events are the mitogen-activated protein kinase (MAPK) cascades, whose components are evolutionarily highly conserved in structure and organization. 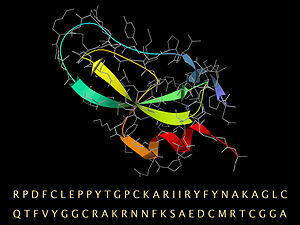 Each consisting of a module of three cytoplasmic kinases: a mitogen-activated protein (MAP) kinase kinase kinase (MAPKKK), an MAP kinase kinase (MAPKK), and the MAP kinase (MAPK) itself. There are three welldefined MAPK pathways: extracellular signal-protein regulated protein kinase (ERK1/ERK2, or p42/p44MAPKs) the p38 kinases [22, 23]; and the c-JunNH2-terminal kinases/stress-activated protein kinases (JNK/SAPKs) [24-27]. Though thrombin is most often considered as a haemostatic protein, its roles as mitogen and chemoattractant are well described [29-33]. To date, no evidence has been presented demonstrating a possible direct and long-term effect that thrombin preparations may have on anastomotic patency and vein graft failure. We had tested the impact of topical bovine thrombin affect at the anastomosis. Surgical Procedure: We have developed a porcine arteriovenous (AV) graft model that used to investigate the proliferative response and aid in the development of new therapies to prevent intimal-medial hyperplasia and improve graft patency. Left carotid artery to right external jugular vein fistulas were made using standard 6mm PTFE (Atrium Medical) in the necks of swine. Immediately following completion of the vascular anastomosis, flow rate were recorded in the venous outflow tract and again after 7 days. In one group of animals (n=4), the venous outflow tract was developed a significant proliferative response. For each set of test groups 5,000 units of thrombin JMI versus saline control on the vascular anastomosis at the completion of the surgical procedure used. Porcine external jugular veins were harvested at 24h and 1 week to characterize the molecular nature of signaling process at the anastomosis. Ki67 Immunostaining: The harvested vein grafts were fixed in formalin for 24h at 25C before transferred into 70%ETOH if necessary, then the samples were cut and placed in paraffin blocks. The veins were dewaxed, blocked the endogenous peroxidase activity in 3% hydrogen peroxide in methanol, and followed by the antigen retrieval in 1M-citrate buffer (pH 6.0). The samples were cooled, rinsed with PBS before blocking the sections with 5% goat serum. The sections were immunoblotted for Ki67 clone MSB-1 (DakoCode# M7240) in one to fifty dilution for an hour at room temperature, visualized through biotinylated secondary antibody conjugation (Zymed, Cat # 85-8943) to the tertiary HRP-Streptavidin enzyme conjugate, colored by the enzyme substrate, DAB (dinitro amino benzamidine) as a chromogen, and counterstained with nuclear fast. As a result, positive tissues became brown and negatives were red. MAPKs Immunostaining: The staining of MAPKs differs at the antigen retrieval, completed with Ficin from Zymed and rinsed. The immunoblotting, primary antibody incubation, done at 4 C overnight with total and activated forms of each MAPKs, which are being rabbit polyclonal antibodies used at 1/100 dilution (Cell Signaling) ERK, pERK, JNK, pJNK, p38, and except pp38 which was a mouse monoclonal antibody. The chromogen exposure accomplished by Vectastain ABC system (Vector Laboratories) and completed with DAB/Ni. Immunoblotting: Protein extracts were homogenized in 1g/10ml (w/v) tissue to RIPA (50mM Tris-Cl (pH 8.0), 5 mM EDTA, 150 mM NaCl, 1% Nonidet P-40, 0.5% sodium deoxycholate, 0.1% SDS). Before running the samples on the 4-20% SDS-PAGE, protein concentration were measured by Bradford Assay (BioRad) and adjusted. Following the transfer onto 0.45mM nitrocellulose membrane, blocked in 5% skim milk phosphate buffered saline at 4oC for 4h. Immunoblotted for activated MAPKs and washed the membranes in 0.1% Tween-20 in PBS. The pERK (42/44 kDA), pp38 (43kDA), and pJNK (46, 54 kDa) protein visualized with the polyclonal antibody roused against each in rabbit (1:5000 dilution from 200mg/ml, Cell Signaling) and chemiluminescent detection of anti-rabbit IgG conjugated with horseradish peroxidase (ECL, Amersham Corp). RNA isolation and RT-PCR: The harvested vessels were kept in RNAlater (Ambion, Austin, TX). The total RNA was isolated by RNeasy mini kit (Qiagen, Cat#74104) fibrous animal tissue protocol, using proteinase K as recommended. The two-step protocol had been applied to amplify cDNA by Prostar Ultra HF RT PCR kit (Stratagene Cat# 600166). At first step, cDNA from the total RNA had been synthesized. After denaturing the RNA at 65 oC for 5 min, the Pfu Turbo added at room temperature to the reaction with random primers, then incubated at 42oC for 15min for cDNA amplification. At the second step, hot start PCR reaction had been designed. The reaction conditions were one cycle at 95oC for 1 min, 40 cycles for denatured at 95oC for 1 min, annealed at 50 oC 1min, amplified at 68 oC for 3min, finally one cycle of extension at 68 oC for 10 min in robotic arm thermocycler. The gene specific primers were for PAR1 5’CTG ACG CTC TTC ATG CCC TCC GTG 3’(forward), 5’GAC AGG AAC AAA GCC CGC GAC TTC 3’ (reverse); PAR2 5’GGT CTT TCT TCC GGT CGT CTA CAT 3’ (forward), 5’CCA TAG CAG AAG AGC GGA GCG TCT 3’ (reverse); PAR3 5’ GAG TCC CTG CCC ACA CAG TC 3’ (forward), 5’ TCG CCA AAT ACC CAG TTG TT 3’(reverse), PAR4 5’ GAG CCG AAG TCC TCA GAC AA 3’ (forward), 5’ AGG CCA AAC AGA GTC CA 3’ (reverse). CTGF and Cyr61: The same method we used for the early expression genes cysteine rich gene (Cyr61) and CTGF by use of the gene specific primers. For CTGF the primers were forward and reverse respectively The primers CTGF-(forward) 5′- GGAGCGAGACACCAACC -3′ and CTGF-(reverse) CCAGTCATAATCAAAGAAGCAGC ; Cyr61- (forward) GGAAGCCTTGCT CATTCTTGA and Cyr61- (reverse) TCC AAT CGT GGC TGC ATT AGT were used for RT-PCR. The conditions were hot start at 95C for 1 min, fourty cycles of denaturing for 45 sec at 95C, annealing for 45 sec at 55C and amplifying for 2min at 68C, followed by extension cycle for 10 minutes at 68C. First we had shown the presence of PAR receptors, PAR1, PAR2, PAR3, and PAR4, on the cell membrane by RT-PCR (Figure 1, Figure 1- PAR expression on veins after 24hr) on the vein tissues treated or not treated with thrombin. Figure 1 illustrates RT-PCR analysis of harvested control and thrombin treated veins 24hr after AV graft placement using primers for PARs. We had showed that (Figure 1) there was an increased expression of PAR receptors after the thrombin treatment. These data demonstrate that all the PAR mRNA can be detected in test veins with the elevation of expression after 24 hr treatment with BT. This data the hypothesis for the function of PAR receptors in vascular tissues that they serve not only as sensors to protease activity in the local environment towards coagulation but also reactivity to protease reagents may increase due to inflammatory or proliferative stimuli. Next question was to make linear correlation between the expressions of PARs to elevation of DNA synthesis. We analyzed the cell proliferation mechanism by cell cycle specific antibody, Ki67, and displayed its presence on gross histology sections of vein tissues. Ki67 proteins with some other proteins form a layer around the chromosomes during mitosis, except for the centromers and telemores where there are no genes. Further, Ki67 functions to protect the DNA of the genes from abnormal activation by cytoplasmic activators during the period of mitosis when the nuclear membrane has disappeared. If a cell leaves the cell cycle, all the Ki67 proteins disappear within about 20min. Therefore, measurement of the Ki67 is a very sensitive method to determine the state of the cell behavior after thrombin stimuli. The expressions of Ki67 on the tissues were highly discrete in thrombin applied veins compare to in saline controls. Hence, we concluded that the elevation of DNA synthesis was increased due to TBT activity (Figure 2- Ki67 Proliferation, Fig. 2) and there was a defined cellular proliferation not the enlargement of the cells if TBT used. PARs are GPCRs activate downstream MAPKs, and thrombin was a mitogen. Changes in mitogen activated protein kinases (MAPK), pERK, p-p38, pJNK through both immunocytochemistry and western Immunoblotting were measured. As a result, we had processed the treated veins and controls with total and activated MAPKs to detect presumed change in their activities due to thrombin application. First, ERK was examined in these tissues (in Figure 3, Figure 3-The expression of ERK after thrombin treatment in the tissues). We found that there was a phosphorylation of ERK (Figure3A) compared to paired staining of total protein expression in the experimental column whereas there was no difference between the total and activated staining of control veins. The western blots showed that the activation of pERK in the TBT treated samples 76% T higher than the controls. This data suggest that the proliferation of the vein gained by activation of ERK, which detects proliferation, differentiation and development response to extracellular signals as its role in MAPK pathway. The next target was JNK that plays a role in the inflammation, stress, and differentiation. In figure 4, Figure 4-The expression of JNK after thrombin treatment in the tissues, there was an activation of JNK when its pair expression was compared suggesting that there should be an inflammatory response after the thrombin application. This piece supports the previous studies done in Lawson lab for autoimmune response mechanism due to ectopical thrombin use in the patients. The application of thrombin elevated the activation of JNK almost two fold compare to without TBT in western blots. Among the other MAPKs we had tested it has the weakest expression towards thrombin treatment. Finally, we had tested p38 as shown in Figure 5,Figure5-The expression of p38 after thrombin treatment in the tissues. The expression of p38 was higher than JNK but much lower than ERK. Unlike JNK it was not showed pockets of expression around the tissue but it was dispersed. If TBT used on the veins the expression of activated p-p38 was almost twice more than the without ectopic thrombin vein tissues. In general, all MAPKs showed increased in their phosphorylation level. The level of activated MAPK expression was increased 200% in the tested animal. The order of expression from high to low would be ERK, JNK, and p38. The application of thrombin during surgeries may seem helping to place the graft but later even it may even affect to change the genetic expression towards angiogenesis, as a result occluding the vein for replacement. Overall data about vascularization and angiogenesis show that the cystein rich family genes take place during normal development of the blood vessels as well as during the attack towards the system for protection. The application of thrombin to stop bleeding ignite the expression of the connective tissue growth factor (CTGF) and cystein rich protein (Cyr61), which are two of the CCN family genes, as we shown in Figure 6, Figure 6- The Expression of CTGF and Cyr61 after Thrombin Treatment. Cyr61 was expressed at after 24h and 7 days, but CTGF had started to expressed after 7 days of thrombin application on the extrajugular vein. The ectopical application of thrombin during surgeries should be revised before it used, since according to our data, the application would trigger the expression of PARs in access that leads to the cell proliferation and inflammation through MAPKs as well as downstream gene activation, such as CGTF and Cyr61 towards angiogenesis. As a result, there would be a very fast occlusion in the replaced vessels that will require another transplant in very short time. From cell membrane to the nucleus we had checked the affects of thrombin application on the vein tissues. We had determined that the thrombin is also mitogenic if it is used during surgeries to stop bleeding. This activity results in elevating the expression of PARs that tip the balance of the cells due to following cellular events. It has been established by previous studies that, the thrombin regulates coagulation, platelet aggregation, endothelial cell activation, proliferation of smooth muscle cells, inflammation, wound healing, and other important biological functions. In concert with the coagulation cascade, PARs provide an elegant mechanism that links mechanical information in the form of tissue injury, change of environmental condition, or vascular leak to the cellular responses as if it is a hormonal element function related to time and dose dependent. Consequently, the protein with so many roles needs to be used with cautions if it is really necessary. The first line of evidence was visual since we had observed the thickening of the vessel shortly after TBT used. The histological was established from the evidence of DNA synthesis at S phase by the elevated expression of the Ki67 proteins. These proteins accumulate in cells during cell cycle but their distribution varies within the nucleus at different stages of the cycle. In the daughter cells following mitosis, the Ki67 proteins are present in the perinuclear bodies, which then fuse to give the early nucleoli, so that their number decreases during the growth1 (G1) phase up to the G1-S transition, giving 1-3 large-round-nucleoli in synthesis (S) phase. During the S phase, the nucleoli increase in size up to the S-G2 transition, when the nucleoli assume an irregular outline. Next, level of evidence was the signaling pathway analysis from membrane to the nucleus. As a result of the application the PAR receptors were increased to respond thrombin, therefore, the MAPKs protein expression was increased (fig 3,4,5). Even though PAR2 does not directly response to thrombin, it is activated indirectly. The elevated levels of MAPKs, pERK, pJNK and p-p38 in bovine thrombin treated vessels suggested the change of gene expression. These MAPKKs and MAPKs can create independent signaling modules that may function in parallel. Each module contains three kinases (MAPKKK, MAP kinase kinase, MAPKK, MAPK kinase, and MAPK). The Raf (MAPKKK) -> Mek (MAPKK) -> Erk (MAPK) pathway is activated by mitotic stimuli, and regulates cell proliferation. In our data we had detected the elvation of ERK more than the other MAPKs. In contrast, the JNK and p-38 pathways are activated by cellular stress including telomere shortening, oncogenic activation, environmental stress, reactive oxygen species, UV light, X-rays, and inflammatory cytokines, and regulate cellular processes such as apoptosis. Finally, the stimuli received from MAPKs cause differentiation of the downstream gene expression, this results in the activation of development mechanism toward angiogenesis. The hemostasis of the cells needs to be protected very well to preserve the continuity of actions in the adult life. Conclusion: Bovine thrombin is a mitogen, which may significantly increased vascular smooth muscle cell proliferation following surgery and repair. Therefore, we suggest that bovine thrombin use on vascular tissues seriously reconsidered thinking that there is a diverse response mechanism developed and possibly triggers many other target resulting in a disease according to the condition of the person who receives the care. In long term, understanding these mechanisms will be our future direction to elucidate the function of thrombin from diverse responses such as in transplantation, development and arterosclorosis. In our immediate step, we will elucidate the specific cell type and its cellular response against JMI compared to purified human, purified bovine and topical human thrombin, since veins are made of two kinds of cell populations, endothelial and smooth muscle cells. 1. Seegers, W.H., et al., The use of purified thrombin as a hemostatic agent. Science, 1939. 89: p. 86. 2. Warner ED, B.K., Seegers WH, Smith HP, Further experience with the use of thrombin as a hemostatic agent. Proceedings of the Society for Experimental Biology, 1939. 41: p. 655-77. 3. TidrickRT, S.W., Warner ED, Clinical experience with thrombin as an Hemostatic Agent. Surgery, 1943. 14: p. 191-16. 4. Alving, B.M., et al., Fibrin sealant: summary of a conference on characteristics and clinical uses [see comments]. Transfusion, 1995. 35(9): p. 783-90. 5. Machovich, R., Clinical use of thrombin., in In the thrombin, R. Machovich, Editor. 1984, CRC Press: Boca Raton, FL. p. 105-106. 6. Vaziri, N.D., Topical thrombin and control of bleeding from the fistula puncture sites in dialyzed patients. Nephron., 1979. 24(5): p. 254-6. 7. Reeder, S.B., D.M. Widlus, and M. Lazinger, Low-dose thrombin injection to treat iatrogenic femoral artery pseudoaneurysms. AJR. American Journal of Roentgenology., 2001. 177(3): p. 595-8. 8. Ferguson, J.D., et al., Ultrasound guided percutaneous thrombin injection of iatrogenic femoral artery pseudoaneurysms after coronary angiography and intervention. Heart (British Cardiac Society)., 2001. 85(4): p. E5. 9. Dahlback, B., Blood coagulation. Lancet, 2000. 355(9215): p. 1627-32. 10. Bar-Shavit, R., et al., Thrombin chemotactic stimulation of HL-60 cells: studies on thrombin responsiveness as a function of differentiation. Journal of Cellular Physiology., 1987. 131(2): p. 255-61. 11. Coughlin, S.R., Thrombin receptor structure and function. Thrombosis & Haemostasis, 1993. 70(1): p. 184-7. 12. Coughlin, S.R., Thrombin Signaling and Protease-Activated-Receptors. Nature, 2000. 407: p. 258-264. 13. Coughlin, S.R., How the protease thrombin talks to cells. Proceedings of the National Academy of Sciences of the United States of America, 1999. 96(20): p. 11023-7. 14. Apostolidis, A. and R.H. Weiss, Divergence in the G-protein-coupled receptor mitogenic signalling pathway at the level of Raf kinase. Cellular Signalling, 1997. 9(6): p. 439-45. 15. Capers, Q.t., et al., Vascular thrombin receptor regulation in hypertensive rats. Circulation Research, 1997. 80(6): p. 838-44. 16. Nerem, R.M., Alexander, R.W., Chappell, D.C., Medford, R.M., Varner, S.E., Taylor, W.R., The study of the influence of flow on vascular endothelial biology. American Journal of the Medical Sciences, 1998. 316: p. 169-175. 17. Maulon, L., et al., T-Cell receptor signaling pathway exerts a negative control on thrombin-mediated increase in [Ca2+]i and p38 MAPK activation in Jurkat T cells: implication of the tyrosine kinase p56Lck. Blood, 1998. 91(11): p. 4232-41. 18. Rudroff, C., et al., Characterization of functional thrombin receptors in human pancreatic tumor cells (MIA PACA-2). Pancreas, 1998. 16(2): p. 189-94. 19. Hirschi, K.K., Rohovsky, S.A., Beck, L.H., D’Amore, P.A., Endothelial cells modulate the proliferation of mural cell precursors via PDGF-BB and heterotypic cell contact. Circulation Research (in press), 1999. 20. Lockwood, C.J., Heritable coagulopathies in pregnancy. Obstetrical & Gynecological Survey, 1999. 54(12): p. 754-65. 21. Tsopanoglou, N.E. and M.E. Maragoudakis, On the mechanism of thrombin-induced angiogenesis. Potentiation of vascular endothelial growth factor activity on endothelial cells by up-regulation of its receptors. Journal of Biological Chemistry, 1999. 274(34): p. 23969-76. 22. Hadcock, J.R. and C.C. Malbon, Agonist regulation of gene expression of adrenergic receptors and G proteins. Journal of Neurochemistry, 1993. 60(1): p. 1-9. 23. Hadcock, J.R., et al., Cross-talk between tyrosine kinase and G-protein-linked receptors. Phosphorylation of beta 2-adrenergic receptors in response to insulin. Journal of Biological Chemistry, 1992. 267(36): p. 26017-22. 24. Sanchez, I., et al., Role of SAPK/ERK kinase-1 in the stress-activated pathway regulating transcription factor c-Jun. Nature, 1994. 372(6508): p. 794-8. 25. Derijard, B., et al., JNK1: a protein kinase stimulated by UV light and Ha-Ras that binds and phosphorylates the c-Jun activation domain. Cell, 1994. 76(6): p. 1025-37. 26. Kallunki, T., et al., JNK2 contains a specificity-determining region responsible for efficient c-Jun binding and phosphorylation. Genes & Development, 1994. 8(24): p. 2996-3007. 27. Kyriakis, J.M., et al., The stress-activated protein kinase subfamily of c-Jun kinases. Nature, 1994. 369(6476): p. 156-60. 28. Gerwins, P., J.L. Blank, and G.L. Johnson, Cloning of a novel mitogen-activated protein kinase kinase kinase, MEKK4, that selectively regulates the c-Jun amino terminal kinase pathway. Journal of Biological Chemistry, 1997. 272(13): p. 8288-95. 29. Weiss, R.H. and R. Nuccitelli, Inhibition of tyrosine phosphorylation prevents thrombin-induced mitogenesis, but not intracellular free calcium release, in vascular smooth muscle cells. Journal of Biological Chemistry., 1992. 267(8): p. 5608-13. 30. Naldini, A., et al., Thrombin enhances T cell proliferative responses and cytokine production. Cellular Immunology., 1993. 147(2): p. 367-77. 31. Clohisy, D.R., J.M. Erdmann, and G.D. Wilner, Thrombin binds to murine bone marrow-derived macrophages and enhances colony-stimulating factor-1-driven mitogenesis. Journal of Biological Chemistry., 1990. 265(14): p. 7729-32. 32. Herbert, J.M., I. Lamarche, and F. Dol, Induction of vascular smooth muscle cell growth by selective activation of the thrombin receptor. Effect of heparin. FEBS Letters, 1992. 301(2): p. 155-8. 33. McNamara, C.A., et al., Thrombin stimulates proliferation of cultured rat aortic smooth muscle cells by a proteolytically activated receptor [see comments]. Journal of Clinical Investigation, 1993. 91(1): p. 94-8. 34. Bardwell, L. and J. Thorner, A conserved motif at the amino termini of MEKs might mediate high-affinity interaction with the cognate MAPKs. Trends in Biochemical Sciences, 1996. 21(10): p. 373-4. 35. Enslen, H. and R.J. Davis, Regulation of MAP kinases by docking domains. Biology of the Cell, 2001. 93(1-2): p. 5-14. 36. Kyriakis, J.M. and J. Avruch, Mammalian mitogen-activated protein kinase signal transduction pathways activated by stress and inflammation. Physiological Reviews, 2001. 81(2): p. 807-69. 37. Grandaliano, G., et al., Mitogenic signaling of thrombin in mesangial cells: role of tyrosine phosphorylation. American Journal of Physiology, 1994. 267(4 Pt 2): p. F528-36. 38. Grandaliano, G., A.J. Valente, and H.E. Abboud, A novel biologic activity of thrombin: stimulation of monocyte chemotactic protein production. Journal of Experimental Medicine, 1994. 179(5): p. 1737-41. 39. Stouffer, G.A. and M.S. Runge, The role of secondary growth factor production in thrombin-induced proliferation of vascular smooth muscle cells. Seminars in Thrombosis & Hemostasis, 1998. 24(2): p. 145-50. 40. Weiss, R.H. and M. Maduri, The mitogenic effect of thrombin in vascular smooth muscle cells is largely due to basic fibroblast growth factor. Journal of Biological Chemistry, 1993. 268(8): p. 5724-7. 41. Alexandropoulos, K., et al., Evidence that a G-protein transduces signals initiated by the protein-tyrosine kinase v-Fps. Journal of Biological Chemistry, 1991. 266(24): p. 15583-6. Jeffrey H. Lawson, M.D., Ph.D.
INTRODUCTION Each year it is estimated that 350,000 patients in the United States, and 650,000 worldwide undergo cardiopulmonary bypass (CPB). Despite advances in surgical techniques and perioperative management the morbidity and mortality of cardiac surgery related to the systemic inflammatory response syndrome(SIRS), especially in neonates is devastatingly significant. Cardiopulmonary bypass exerts an extreme challenge upon the haemostatic system as part of the systemic inflammatory syndrome predisposing to excessive bleeding as well as other multisystem dysfunction (1). Over the past decade major strides have been made in the understanding of the pathophysiology of the inflammatory response following CPB and the role of the vascular endothelium has emerged as critical in maintaining cardiovascular homeostasis (2). CPB results in endothelial cell activation and initiation of coagulation via the Tissue Factor dependent pathway and consumption of important clotting factors. The major stimulus for thrombin generation during CPB has been shown to be through the tissue factor dependent pathway. As well as its effects on the fibrin and platelets thrombin has been found to play a role in a host of inflammatory responses in the vascular endothelium. The recent discovery of the Protease-Activated Receptors (PAR), one of which through which thrombin acts (PAR-1) has stimulated interest that they may provide a vital link between inflammation and coagulation (3). Aprotinin is a nonspecific serine protease inhibitor that has been used for its ability to reduce blood loss and preserve platelet function during cardiac surgery procedures requiring cardiopulmonary bypass and thus the need for subsequent blood and blood product transfusions. However there have been concerns that aprotinin may be pro-thrombotic, especially in the context of coronary artery bypass grafting, which has limited its clinical use. These reservations are underlined by the fact that the mechanism of action of aprotinin has not been fully understood. Recently aprotinin has been shown to exert anti-thrombotic effects mediated by blocking the PAR-1 (4). Much less is known about its effects on endothelial cell activation, especially in terms of Tissue Factor but it has been proposed that aprotinin may also exert protective effects at the endothelial level via protease-activated receptors (PAR1 and PAR2). In this study we simulated in vitro the effects of endothelial cell activation during CPB by stimulating Human Umbilical Vein Endothelial Cells (HUVECs) with a proinflammatory cytokine released during CPB, Tumor Necrosis Factor (TNF-a) and characterize the effects of aprotinin treatment on TF expression, PAR1 and PAR2 expression, cytokine release IL-6 and tPA secretion. In order to investigate the mechanism of action of aprotinin we studied its effects on PAR activation by various agonists and ligands. These experiments provide insight into the effects of aprotinin on endothelial related coagulation mechanisms in terms of Tissue Factor expression and indicate it effects are mediated through Protease-Activated Receptors (PAR), which are seven membrane spanning proteins called G-protein coupled receptors (GPCR), that link coagulant and inflammatory pathways. Therefore, in this study we examine the effects of aprotinin on the human endothelial cell coagulation biology by different-dose aprotinin, 200 and 1600units. The data demonstrates that aprotinin appears to directly alter endothelial expression of inflammatory cytokines, tPA and PAR receptor expression following treatment with TNF. The direct mechanism of action is unknown but may act via local protease inhibition directly on endothelial cells. It is hoped that with improved understanding of the mechanisms of action of aprotinin, especially an antithrombotic effect at the endothelial level the fears of prothrombotic tendency may be lessened and its use will become more routine. METHODS Human Umbilical Vein Endothelial Cells (HUVECS) used as our model to study the effects of endothelial cell activation on coagulant biology. In order to simulate the effects of cardiopulmonary bypass at the endothelial cell interface we stimulated the cells with the proinflammatory cytokine TNFa. In the study group the HUVECs were pretreated with low (200kIU/mL) and high (1600kIU/mL) dosages of aprotinin prior to stimulation with TNFa and complement activation fragments. The effects of TNFa stimulation upon endothelial Tissue Factor expression, PAR1 and PAR2 expression, and tPA and IL6 secretion were determined and compared between control and aprotinin treated cells. In order to delineate whether aprotinin blocks PAR activation via its protease inhibition properties we directly activated PAR1 and PAR2 using specific agonist ligands such thrombin (PAR1), trypsin, Factor VIIa, Factor Xa (PAR2) in the absence and presence of aprotinin. Endothelial Cell Culture HUVECs were supplied from Clonetics. The cells were grown in EBM-2 containing 2MV bullet kit, including 5% FBS, 100-IU/ml penicillin, 0.1mg/mL streptomycin, 2mmol/L L-glutamine, 10 U/ml heparin, 30µg/mL EC growth supplement (ECGS). Before the stimulation cells were starved in 0.1%BSA depleted with FBS and growth factors for 24 hours. Cells were sedimented at 210g for 10 minutes at 4C and then resuspended in culture media. The HUVECs to be used will be between 3 and 5 passages. Assay of IL-6 and tPA production Levels of IL-6 were measured with an ELISA based kit (RDI, MN) according to the manufacturers instructions. tPA was measured using a similar kit (American Diagnostica). Flow Cytometry The expression of transmembrane proteins PAR1, PAR2 and tissue factor were measured by single color assay as FITC labeling agent. Prepared suspension of cells disassociated trypsin free cell disassociation solution (Gibco) to be labeled. First well washed, and resuspended into “labeling buffer”, phosphate buffered saline (PBS) containing 0.5% BSA plus 0.1% NaN3, and 5% fetal bovine serum to block Fc and non-specific Ig binding sites. Followed by addition of 5mcl of antibody to approx. 1 million cells in 100µl labeling buffer and incubate at 4C for 1 hour. After washing the cells with 200µl with wash buffer, PBS + 0.1% BSA + 0.1% NaN3, the cells were pelletted at 1000rpm for 2 mins. Since the PAR1 and PAR2 were directly labeled with FITC these cells were fixed for later analysis by flow cytometry in 500µl PBS containing 1%BSA + 0.1% NaN3, then add equal volume of 4% formalin in PBS. For tissue factor raised in mouse as monoclonal primary antibody, the pellet resuspended and washed twice more as before, and incubated at 4C for 1 hour addition of 5µl donkey anti-mouse conjugated with FITC secondary antibody directly to the cell pellets at appropriate dilution in labeling buffer. After the final wash three times, the cell pellets were resuspended thoroughly in fixing solution. These fixed and labeled cells were then stored in the dark at 4C until there were analyzed. On analysis, scatter gating was used to avoid collecting data from debris and any dead cells. Logarithmic amplifiers for the fluorescence signal were used as this minimizes the effects of different sensitivities between machines for this type of data collection. Measured the intracellular calcium mobilization by Fluo-3AM. HUVECs were grown in calcium and phenol free EBM basal media containing 2MV bullet kit. Then the cell cultures were starved with the same media by 0.1% BSA without FBS for 24 hour with or without TNFa stimulation presence or absence of aprotinin (200 and 1600KIU/ml). Next the cells were loaded with Fluo-3AM 5µg/ml containing agonists, PAR1 specific peptide SFLLRN-PAR1 inhibitor, PAR2 specific peptide SLIGKV-PAR2 inhibitor, human alpha thrombin, trypsin, factor VIIa, factor Xa for an hour at 37C in the incubation chamber. Finally the media was replaced by Flou-3AM free media and incubated for another 30 minutes in the incubation chamber. The readings were taken at fluoromatic bioplate reader. For comparison purposes readings were taken before and during Fluo-3AM loading as well. RESULTS Aprotinin reduces IL-6 production from activated/stimulated HUVECS The effects of aprotinin analyzed on HUVEC for the anti-inflammatory effects of aprotinin at cultured HUVECS with high and low doses. Figure 1 shows that TNF-a stimulated a considerable increase in IL-6 production, 370.95 ± 109.9 mg/mL. If the drug is used alone the decrease of IL-6 at the low dose is 50% that is 183.95 ng/ml and with the high dose of 20% that is 338.92 from 370.95ng/ml being compared value. TNFa-aprotinin results in reduction of the IL-6 expression from 370.95ng/ml to 58.6 (6.4fold) fro A200 and 75.85 (4.9 fold) ng/ml, for A1600. After the treatment the cells reach to the below baseline limit of IL-6 expression. Aprotinin at the high dose (1600kIU/mL), 183.95 ± 13.06mg/mL but not low dose (200kIU/mL) significantly reduced IL-6 production from TNF-a stimulated HUVECS (p=0.043). Therefore, the aprotinin prevents inflammation as well as loss of blood. Aprotinin reduces tPA production from stimulated HUVECS Whether aprotinin exerted part of its fibrinolytic effects through inhibition of tPA mediated plasmin generation examined by the effects on TNFa stimulated HUVECS. Figure 2 also demonstrates that the amount of tPA released from HUVECS under resting, non-stimulated conditions incubated with aprotinin are significantly different. Figure 2 represents that the resting level of tPA released from non-stimulated cells significantly, by 100%, increase following TNF-a stimulation for 24 hours. After application of aprotinin alone at two doses the tPA level goes down 25% of TNFa stimulated cells. However, aprotinin treatment of TNF-a activated endothelial cells significantly lower the amount of tPA release in a dose dependent manner that is low dose decreased 25 but high dose causes 50% decrease of tPA expression (A200 p=0.0018, A1600 p=0.033) This finding suggests that aprotinin exerts a direct inhibitory effect on endothelial cell tPA production. TF is expressed when the cell in under stress such as TNFa treatments. The stimulated HUVECs with TNF-a tested for the expression of PAR1, PAR2, and tissue factor by single color flow cytometry through FITC labeled detection antibodies at 1, 3, and 24hs. Figure 3 demonstrates that there is a fluctuation of TF expression from 1 h to 24h that the TF decreases at first hour after aprotinin application 50% and 25%, A1600 and A200 respectively. Then at 3 h the expression come back up 50% more than the baseline. Finally, at 24h the expression of TF becomes almost as same as baseline. Moreover, TNFa stimulated cells remains 45% higher than baseline after at 3h as well as at 24h. Figure 4 demonstrates that aprotinin reduces the PAR1 expression 80% at 24h but there is no affect at 1 and 3 h intervals for both doses. During the treatment with aprotinin only high dose at 1 hour time interval decreases the PAR1 expression on the cells. This data explains that ECCB is affected due to the expression of PAR1 is lowered by the high dose of aprotinin. Figure 5 shows the high dose of aprotinin reduces the PAR2 expression close to 25% at 1h, 50% at 3h and none at 24h. This pattern is exact opposite of PAR1 expression. Figure 5 demonstrates the 50% decrease at 3h interval only. Does that mean aprotinin affecting the inflammation first and then coagulation? This suggests that aprotinin may affect the PAR2 expression at early and switched to PAR1 reduction later time intervals. This fluctuation can be normal because aprotinin is not a specific inhibitor for proteases. This approach make the aprotinin work better the control bleeding and preventing the inflammation causing cytokine such as IL-6. The specificity of aprotinin’s actions upon PAR studied the effects of the agent on calcium release following proteolytic and non-proteolytic stimulation of PAR1 and PAR2. Figure 6A (Figure 6) shows the stimulation of the cells with the PAR1 specific peptide (SFLLRN) results in release of calcium from the cells. Pretreatment of the cells with aprotinin has no significant effect on PAR1 peptide stimulated calcium release. This suggests that aprotinin has no effect upon the non-proteolytic direct activation of the PAR 1 receptor. Yet, Figure 6B (Figure 6) demonstrates human alpha thrombin does interact with the drug as a result the calcium release drops below base line after high dose (A1600) aprotinin used to zero but low dose does not show significant effect on calcium influx. Figure 7 demonstrates the direct PAR2 and indirect PAR2 stimulation by hFVIIa, hFXa, and trypsin of cells. Similarly, at Figure 7A aprotinin has no effect upon PAR2 peptide stimulated calcium release, however, at figures 7B, C, and D shows that PAR2 stimulatory proteases Human Factor Xa, Human Factor VIIa and Trypsin decreases calcium release. 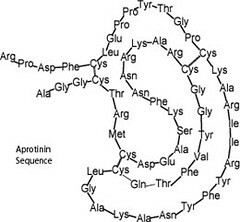 These findings indicate that aprotinin’s mechanism of action is directed towards inhibiting proteolytic cleavage and hence subsequent activation of the PAR1 and PAR2 receptor complexes. The binding site of the aprotinin on thrombin possibly is not the peptide sequence interacting with receptors. Measurement of calcium concentration is essential to understand the mechanism of aprotinin on endothelial cell coagulation and inflammation because these mechanisms are tightly controlled by presence of calcium. For example, activation of PAR receptors cause activation of G protein q subunit that leads to phosphoinositol to secrete calcium from endoplasmic reticulum into cytoplasm or activation of DAG to affect Phospho Lipase C (PLC). In turn, certain calcium concentration will start the serial formation of chain reaction for coagulation. Therefore, treatment of the cells with specific factors, thrombin receptor activating peptides (TRAPs), human alpha thrombin, trypsin, human factor VIIa, and human factor Xa, would shed light into the effect of aprotinin on the formation of complexes for pro-coagulant activity. DISCUSSION There are two fold of outcomes to be overcome during cardiopulmonary bypass (CPB): mechanical stress and the contact of blood with artificial surfaces results in the activation of pro- and anticoagulant systems as well as the immune response leading to inflammation and systemic organ failure. This phenomenon causes the “postperfusion-syndrome”, with leukocytosis, increased capillary permeability, accumulation of interstitial fluid, and organ dysfunction. CPB is also associated with a significant inflammatory reaction, which has been related to complement activation, and release of various inflammatory mediators and proteolytic enzymes. CPB induces an inflammatory state characterized by tumor necrosis factor-alpha release. Aprotinin, a low molecular-weight peptide inhibitor of trypsin, kallikrein and plasmin has been proposed to influence whole body inflammatory response inhibiting kallikrein formation, complement activation and neutrophil activation (5, 6). But shown that aprotinin has no significant influence on the inflammatory reaction to CPB in men. Understanding the endothelial cell responses to injury is therefore central to appreciating the role that dysfunction plays in the preoperative, operative, and postoperative course of nearly all cardiovascular surgery patients. Whether aprotinin increases the risk of thrombotic complications remains controversial. The anti-inflammatory properties of aprotinin in attenuating the clinical manifestations of the systemic inflammatory response following cardiopulmonary bypass are well known(15) 16) However its mechanisms and targets of action are not fully understood. In this study we have investigated the actions of aprotinin at the endothelial cell level. Our experiments showed that aprotinin reduced TNF-a induced IL-6 release from cultured HUVECS. Thrombin mediates its effects through PAR-1 receptor and we found that aprotinin reduced the expression of PAR-1 on the surface of HUVECS after 24 hours incubation. We then demonstrated that aprotinin inhibited endothelial cell PAR proteolytic activation by thrombin (PAR-1), trypsin, factor VII and factor X (PAR-2) in terms of less release of Ca preventing the activation of coagulation. So aprotinin made cells produce less receptor, PAR1, PAR2, and TF as a result there would be less Ca++ release. Our findings provide evidence for anti-inflammatory as well as anti-coagulant properties of aprotinin at the endothelial cell level, which may be mediated through its inhibitory effects on proteolytic activation of PARs. IL6 Elevated levels of IL-6 have been shown to correlate with adverse outcomes following cardiac surgery in terms of cardiac dysfunction and impaired lung function(Hennein et al 1992). Cardiopulmonary bypass is associated with the release of the pro-inflammatory cytokines IL-6, IL-8 and TNF-a. IL-6 is produced by T-cells, endothelial cells as a result monocytes and plasma levels of this cytokine tend to increase during CPB (21, 22). In some studies aprotinin has been shown to reduce levels of IL-6 post CPB(23) Hill(5). Others have failed to demonstrate an inhibitory effect of aprotinin upon pro-inflammatory cytokines following CPB(24) (25). Our experiments showed that aprotinin significantly reduced the release of IL-6 from TNF-a stimulated endothelial cells, which may represent an important target of its anti-inflammatory properties. Its has been shown recently that activation of HUVEC by PAR-1 and PAR-2 agonists stimulates the production of IL-6(26). Hence it is possible that the effects of aprotinin in reducing IL-6 may be through targeting activation of such receptors. TPA Tissue Plasminogen activator is stored, ready made, in endothelial cells and it is released at its highest levels just after commencing CPB and again after protamine administration. The increased fibrinolytic activity associated with the release of tPA can be correlated to the excessive bleeding postoperatively. Thrombin is thought to be the major stimulus for release of t-PA from endothelial cells. Aprotinin’s haemostatic properties are due to direct inhibition of plasmin, thereby reducing fibrinolytic activity as well as inhibiting fibrin degradation. Aprotinin has not been shown to have any significant effect upon t-PA levels in patients post CPB(27), which would suggest that aprotinin reduced fibrinolytic effects are not the result of inhibition of t-PA mediated plasmin generation. Our study, however demonstrates that aprotinin inhibits the release of t-PA from activated endothelial cells, which may represent a further haemostatic mechanism at the endothelial cell level. TF Resting endothelial cells do not normally express tissue factor on their cell surface. Inflammatory mediators released during CPB such as complement (C5a), lipopolysaccharide, IL-6, IL-1, TNF-a, mitogens, adhesion molecules and hypoxia may induce the expression of tissue factor on endothelial cells and monocytes. The expression of TF on activated endothelial cells activates the extrinsic pathway of coagulation, ultimately resulting in the generation of thrombin and fibrin. Aprotinin has been shown to reduce the expression of TF on monocytes in a simulated cardiopulmonary bypass circuit (28). It has been suggested that aprotinin may target PAR on other cells types, especially endothelial cells. We investigated the role of PARs in endothelial cell activation and whether they can be the targets for aprotinin. In recent study by Day group(30) demonstrated that endothelial cell activation by thrombin and downstream inflammatory responses can be inhibited by aprotinin in vitro through blockade of protease-activated receptor 1. Our results provide a new molecular basis to help explain the anti-inflammatory properties of aprotinin reported clinically. The finding that PAR-2 can also be activated by the coagulation enzymes factor VII and factor X indicates that PAR may represent the link between inflammation and coagulation. PAR-2 is believed to play an important role in inflammatory response. PAR-2 are widely expressed in the gastrointestinal tract, pancreas, kidney, liver, airway, prostrate, ovary, eye of endothelial, epithelial, smooth muscle cells, T-cells and neutrophils. Activation of PAR-2 in vivo has been shown to be involved in early inflammatory processes of leucocyte recruitment, rolling, and adherence, possibly through a mechanism involving platelet-activating factor (PAF) We investigated the effects of TNFa stimulation on PAR-1 and PAR-2 expression on endothelial cells. Through functional analysis of PAR-1 and PAR-2 by measuring intracellular calcium influx we have demonstrated that aprotinin blocks proteolytic cleavage of PAR-1 by thrombin and activation of PAR-2 by the proteases trypsin, factor VII and factor X. This confirms the previous findings on platelets of an endothelial anti-thrombotic effect through inhibition of proteolysis of PAR-1. In addition, part of aprotinin’s anti-inflammatory effects may be mediated by the inhibition of serine proteases that activate PAR-2. There have been conflicting reports regarding the regulation of PAR-1 expression by inflammatory mediators in cultured human endothelial cells. Poullis et al first showed that thrombin induced platelet aggregation was mediated by via the PAR-1(4) and demonstrated that aprotinin inhibited the serine protease thrombin and trypsin induced platelet aggregation. Aprotinin did not block PAR-1 activation by the non-proteolytic agonist peptide, SFLLRN indicating that the mechanism of action was directed towards inhibiting proteolytic cleavage of the receptor. Nysted et al showed that TNF did not affect mRNA and cell surface protein expression of PAR-1 (35), whereas Yan et al showed downregulation of PAR-1 mRNA levels (36). Once activated PAR1 and PAR2 are rapidly internalized and then transferred to lysosomes for degradation. Endothelial cells contain large intracellular pools of preformed receptors that can replace the cleaved receptors over a period of approximately 2 hours, thus restoring the capacity of the cells to respond to thrombin. In this study we found that after 1-hour stimulation with TNF there was a significant upregulation in PAR-1 expression. However after 3 hours and 24 hours there was no significant change in PAR-1 expression suggesting that cleaved receptors had been internalized and replenished. Aprotinin was interestingly shown to downregulate PAR-1 expression on endothelial cells at 1 hour and increasingly more so after 24 hours TNF stimulation. These findings may suggest an effect of aprotinin on inhibiting intracellular cycling and synthesis of PAR-1. Conclusions Our study has identified the anti-inflammatory and coagulant effects of aprotinin at the endothelial cell level. All together aprotinin affects the ECCB by reducing the t-PA, IL-6, PAR1, PAR 2, TF expressions. Our data correlates with the previous foundlings in production of tPA (7, (8) 9) 10), and decreased IL-6 levels (11) during coronary artery bypass graft surgery (12-14). We have importantly demonstrated that aprotinin may target proteolytic activation of endothelial cell associated PAR-1 to exert a possible anti-inflammatory effect. This evidence should lessen the concerns of a possible prothrombotic effect and increased incidence of graft occlusion in coronary artery bypass patients treated with aprotinin. Aprotinin may also inhibit PAR-2 proteolytic activation, which may represent a key mechanism for attenuating the inflammatory response at the critical endothelial cell level. Although aprotinin has always been known as a non-specific protease inhibitor we would suggest that there is growing evidence for a PAR-ticular mechanism of action. 1. Levy, J. H., and Tanaka, K. A. Inflammatory response to cardiopulmonary bypass. Ann Thorac Surg. 75: S715-720, 2003. 2. Verrier, E. D., and Morgan, E. N. Endothelial response to cardiopulmonary bypass surgery. Ann Thorac Surg. 66: S17-19; discussion S25-18, 1998. 3. Cirino, G., Napoli, C., Bucci, M., and Cicala, C. Inflammation-coagulation network: are serine protease receptors the knot? Trends Pharmacol Sci. 21: 170-172, 2000. 4. Poullis, M., Manning, R., Laffan, M., Haskard, D. O., Taylor, K. M., and Landis, R. C. The antithrombotic effect of aprotinin: actions mediated via the proteaseactivated receptor 1. J Thorac Cardiovasc Surg. 120: 370-378, 2000. 5. Hill, G. E., Alonso, A., Spurzem, J. R., Stammers, A. H., and Robbins, R. A. Aprotinin and methylprednisolone equally blunt cardiopulmonary bypass-induced inflammation in humans. J Thorac Cardiovasc Surg. 110: 1658-1662, 1995. 6. Hill, G. E., Pohorecki, R., Alonso, A., Rennard, S. I., and Robbins, R. A. Aprotinin reduces interleukin-8 production and lung neutrophil accumulation after cardiopulmonary bypass. Anesth Analg. 83: 696-700, 1996. 7. Lu, H., Du Buit, C., Soria, J., Touchot, B., Chollet, B., Commin, P. L., Conseiller, C., Echter, E., and Soria, C. Postoperative hemostasis and fibrinolysis in patients undergoing cardiopulmonary bypass with or without aprotinin therapy. Thromb Haemost. 72: 438-443, 1994. 8. de Haan, J., and van Oeveren, W. Platelets and soluble fibrin promote plasminogen activation causing downregulation of platelet glycoprotein Ib/IX complexes: protection by aprotinin. Thromb Res. 92: 171-179, 1998. 9. Erhardtsen, E., Bregengaard, C., Hedner, U., Diness, V., Halkjaer, E., and Petersen, L. C. The effect of recombinant aprotinin on t-PA-induced bleeding in rats. Blood Coagul Fibrinolysis. 5: 707-712, 1994. 10. Orchard, M. A., Goodchild, C. S., Prentice, C. R., Davies, J. A., Benoit, S. E., Creighton-Kemsford, L. J., Gaffney, P. J., and Michelson, A. D. Aprotinin reduces cardiopulmonary bypass-induced blood loss and inhibits fibrinolysis without influencing platelets. Br J Haematol. 85: 533-541, 1993. 11. Tassani, P., Augustin, N., Barankay, A., Braun, S. L., Zaccaria, F., and Richter, J. A. High-dose aprotinin modulates the balance between proinflammatory and anti-inflammatory responses during coronary artery bypass graft surgery. J Cardiothorac Vasc Anesth.14: 682-686, 2000. 12. Asehnoune, K., Dehoux, M., Lecon-Malas, V., Toueg, M. L., Gonieaux, M. H., Omnes, L., Desmonts, J. M., Durand, G., and Philip, I. Differential effects of aprotinin and tranexamic acid on endotoxin desensitization of blood cells induced by circulation through an isolated extracorporeal circuit. J Cardiothorac Vasc Anesth. 16: 447-451, 2002. 13. Dehoux, M. S., Hernot, S., Asehnoune, K., Boutten, A., Paquin, S., Lecon-Malas, V., Toueg, M. L., Desmonts, J. M., Durand, G., and Philip, I. Cardiopulmonary bypass decreases cytokine production in lipopolysaccharide-stimulated whole blood cells: roles of interleukin-10 and the extracorporeal circuit. Crit Care Med. 28: 1721-1727, 2000. 14. Greilich, P. E., Brouse, C. F., Rinder, C. S., Smith, B. R., Sandoval, B. A., Rinder, H. M., Eberhart, R. C., and Jessen, M. E. Effects of epsilon-aminocaproic acid and aprotinin on leukocyte-platelet adhesion in patients undergoing cardiac surgery. Anesthesiology. 100: 225-233, 2004. 15. Mojcik, C. F., and Levy, J. H. Aprotinin and the systemic inflammatory response after cardiopulmonary bypass. Ann Thorac Surg. 71: 745-754, 2001. 16. Landis, R. C., Asimakopoulos, G., Poullis, M., Haskard, D. O., and Taylor, K. M. The antithrombotic and antiinflammatory mechanisms of action of aprotinin. Ann Thorac Surg. 72: 2169-2175, 2001. 17. Asimakopoulos, G., Kohn, A., Stefanou, D. C., Haskard, D. O., Landis, R. C., and Taylor, K. M. Leukocyte integrin expression in patients undergoing cardiopulmonary bypass. Ann Thorac Surg. 69: 1192-1197, 2000. 18. Landis, R. C., Asimakopoulos, G., Poullis, M., Thompson, R., Nourshargh, S., Haskard, D. O., and Taylor, K. M. Effect of aprotinin (trasylol) on the inflammatory and thrombotic complications of conventional cardiopulmonary bypass surgery. Heart Surg Forum. 4 Suppl 1: S35-39, 2001. 19. Asimakopoulos, G., Thompson, R., Nourshargh, S., Lidington, E. A., Mason, J. C., Ratnatunga, C. P., Haskard, D. O., Taylor, K. M., and Landis, R. C. An anti-inflammatory property of aprotinin detected at the level of leukocyte extravasation. J Thorac Cardiovasc Surg. 120: 361-369, 2000. 20. Asimakopoulos, G., Lidington, E. A., Mason, J., Haskard, D. O., Taylor, K. M., and Landis, R. C. Effect of aprotinin on endothelial cell activation. J Thorac Cardiovasc Surg. 122: 123-128, 2001. 21. Butler, J., Chong, G. L., Baigrie, R. J., Pillai, R., Westaby, S., and Rocker, G. M. Cytokine responses to cardiopulmonary bypass with membrane and bubble oxygenation. Ann Thorac Surg. 53: 833-838, 1992. 22. Hennein, H. A., Ebba, H., Rodriguez, J. L., Merrick, S. H., Keith, F. M., Bronstein, M. H., Leung, J. M., Mangano, D. T., Greenfield, L. J., and Rankin, J. S. Relationship of the proinflammatory cytokines to myocardial ischemia and dysfunction after uncomplicated coronary revascularization. J Thorac Cardiovasc Surg. 108: 626-635, 1994. 23. Diego, R. P., Mihalakakos, P. J., Hexum, T. D., and Hill, G. E. Methylprednisolone and full-dose aprotinin reduce reperfusion injury after cardiopulmonary bypass. J Cardiothorac Vasc Anesth. 11: 29-31, 1997. 24. Ashraf, S., Tian, Y., Cowan, D., Nair, U., Chatrath, R., Saunders, N. R., Watterson, K. G., and Martin, P. G. “Low-dose” aprotinin modifies hemostasis but not proinflammatory cytokine release. Ann Thorac Surg. 63: 68-73, 1997. 25. Schmartz, D., Tabardel, Y., Preiser, J. C., Barvais, L., d’Hollander, A., Duchateau, J., and Vincent, J. L. Does aprotinin influence the inflammatory response to cardiopulmonary bypass in patients? J Thorac Cardiovasc Surg. 125: 184-190, 2003. 26. Chi, L., Li, Y., Stehno-Bittel, L., Gao, J., Morrison, D. C., Stechschulte, D. J., and Dileepan, K. N. Interleukin-6 production by endothelial cells via stimulation of protease-activated receptors is amplified by endotoxin and tumor necrosis factor-alpha. J Interferon Cytokine Res. 21: 231-240, 2001. 27. Ray, M. J., and Marsh, N. A. Aprotinin reduces blood loss after cardiopulmonary bypass by direct inhibition of plasmin. Thromb Haemost. 78: 1021-1026, 1997. 28. Khan, M. M., Gikakis, N., Miyamoto, S., Rao, A. K., Cooper, S. L., Edmunds, L. H., Jr., and Colman, R. W. Aprotinin inhibits thrombin formation and monocyte tissue factor in simulated cardiopulmonary bypass. Ann Thorac Surg. 68: 473-478, 1999. 29. Jaggers, J. J., Neal, M. C., Smith, P. K., Ungerleider, R. M., and Lawson, J. H. Infant cardiopulmonary bypass: a procoagulant state. Ann Thorac Surg. 68: 513-520, 1999. 30. Day, J. R., Taylor, K. M., Lidington, E. A., Mason, J. C., Haskard, D. O., Randi, A. M., and Landis, R. C. Aprotinin inhibits proinflammatory activation of endothelial cells by thrombin through the protease-activated receptor 1. J Thorac Cardiovasc Surg. 131: 21-27, 2006. 31. Vergnolle, N. Proteinase-activated receptor-2-activating peptides induce leukocyte rolling, adhesion, and extravasation in vivo. J Immunol. 163: 5064-5069, 1999. 32. Vergnolle, N., Hollenberg, M. D., Sharkey, K. A., and Wallace, J. L. Characterization of the inflammatory response to proteinase-activated receptor-2 (PAR2)-activating peptides in the rat paw. Br J Pharmacol. 127: 1083-1090, 1999. 33. McLean, P. G., Aston, D., Sarkar, D., and Ahluwalia, A. Protease-activated receptor-2 activation causes EDHF-like coronary vasodilation: selective preservation in ischemia/reperfusion injury: involvement of lipoxygenase products, VR1 receptors, and C-fibers. Circ Res. 90: 465-472, 2002. 34. Maree, A., and Fitzgerald, D. PAR2 is partout and now in the heart. Circ Res. 90: 366-368, 2002. 35. Nystedt, S., Ramakrishnan, V., and Sundelin, J. The proteinase-activated receptor 2 is induced by inflammatory mediators in human endothelial cells. Comparison with the thrombin receptor. J Biol Chem. 271: 14910-14915, 1996. 36. Yan, W., Tiruppathi, C., Lum, H., Qiao, R., and Malik, A. B. Protein kinase C beta regulates heterologous desensitization of thrombin receptor (PAR-1) in endothelial cells. Am J Physiol. 274: C387-395, 1998. 37. Shinohara, T., Suzuki, K., Takada, K., Okada, M., and Ohsuzu, F. Regulation of proteinase-activated receptor 1 by inflammatory mediators in human vascular endothelial cells. Cytokine. 19: 66-75, 2002.